I am employed by both the Federal Government (which offers a Thrift Savings Plan) and a university hospital (which offers a 403(b) and a 457 plan). How much can I contribute per year to these retirement plans? First let’s take a look at the different types of retirement accounts available and then look at the contribution limits to them. There are several different types of employer-sponsored retirement plans, depending on what industry you work in. 401(k)s are offered by private companies to employees. The employee contribution limit is $18,000, and the total contribution limit (employee plus employer) is $53,000. If you are age 50 or above, you are allowed to contribute an additional $6,000 as a “catch-up” contribution, meaning that since you are closer to retirement age, your contribution limit would be $24,000. 403(b) accounts are offered by public schools and nonprofits, with the same contribution maximums as 401(k)s: $18,000 in employee contribution and $53,000 total, with “catch-up” provisions for employees age 50 and above. A solo 401(k) is for someone who is self-employed, with the same contribution maximums as above. A Thrift Savings Plan (TSP) is offered to US Government employees and military service members. It also has an employee contribution limit of $18,000 and a total contribution limit of $53,000. 457(b) plans are also called deferred compensation plans, meaning you can store away up to $18,000 per year for after you retire. These plans are sometimes offered to government or municipal employees, public hospital employees, and tax-exempt organizations. Finally, you can also own and contribute to a personal Traditional or Roth IRA outside of your employment. The limit for those contributions in 2016 is $5,500, with a “catch-up” contribution of an additional $1,000 if you are age 50 or older. Now that we’ve dispensed with the account types and limits, how can you combine them? Unfortunately, despite the fact that you are eligible to contribute to a TSP and a 403(b), the limit of $18,000 from you and $53,000 total applies across both these accounts (if you are age 50 or older, the limit is $62,000 because of the “catch-up” provision). 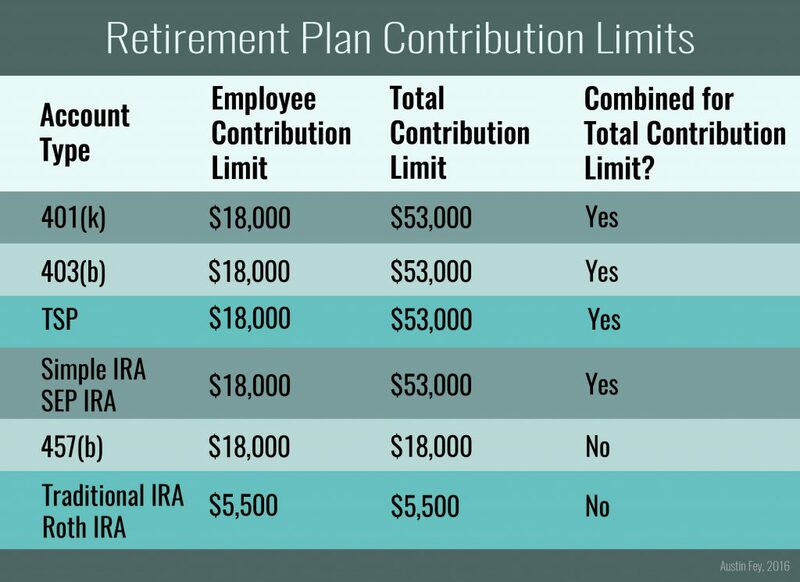 This limit of $53,000 applies across most employer-sponsored retirement plans: 401(k)s, 403(b)s, TSPs, solo 401(k)s, Simple IRAs, SEP IRAs. Since 457 plans are deferred compensation, they are treated differently and have their own limit of $18,000 that you can contribute. This limit is not affected by the TSP/ 401(k)/ 403(b) limit. If you own a Traditional IRA or Roth IRA outside your employer, you can also save $5,500 regardless of how much you contribute to an employer-sponsored retirement plan. This limit is completely separate. 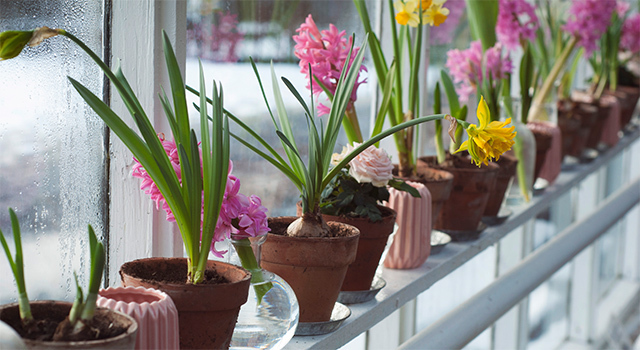 You do need to have earned income to put away in an IRA, but it is not connected to any other retirement plan limits. If you contribute up to $18,000 into a 403(b) and your employer contributes up to the limit (an additional $35,000) in the 403(b), put an additional $18,000 in the 457(b) plan, and save $5,500 in a Roth IRA, you can save a grand total of $76,500. For details on your employers’ retirement plan choices, talk to Human Resources, and see the IRS website for the latest year’s contribution limits. Ultimately, it is your responsibility to make sure you are complying with the contribution limits, so it is always good to do some research to stay informed. Chart by author. Photo used under Creative Commons Zero license.